It’s finally here! For all you last minutes shoppers like me, I pulled together my yearly gift guide of 50 things from artisans, makers, and my favorite shops. Whether you’re shopping for someone else or making your own wish list, these are some of the most beautiful bits & pieces I’ve encountered over the past year. This list is just as much about sharing the love year round as it is about buying things for Christmas. I tend to give things like preserved lemons or infused salts around the holidays. So more than being just about shopping for this holiday season, I wanted this to be a list you can come back to and reference year round, a list that, while far from capturing all of my favorites, gives a great cross section of quality goods. It’s for when you move or renovate, for when your friend has a baby, for birthdays, for just because. Some of these small batch goods might not be able to get to you by Christmas, and others definitely can, but keep them all in mind year round when you’re looking! These are objects of everyday use & beauty and include my favorite bags, books, art, home goods, apothecary, and more. Every single item on this list is something I would buy and use myself, and many of the things I already have and love. If objects aren’t your thing and you prefer to give or receive experiences we have two (and more coming!) very special opportunities that would make great gifts: a one day floral essences & herbalism workshop & meal at my home in Tennessee with Wooden Spoon Apothecary has two spots left and the photography & culinary expedition I’m teaching with Acanela Expeditions in Southeast Asia (we’ll be traveling through Thailand, Cambodia, and Vietnam over ten days together!) just went on sale! You can buy tickets to the herbalism workshop here, and tickets to the expedition here. Want more of this? Check out our guides from 2013 & 2014 too! 22. Handspun Yarns by Camellia Fiber Co.
26. Ceramic French Press by Yield Design Co.
50. Modern Hand Carved Condiment Spoons by Sweet Gum Co. This is such a beautiful gift guide, Beth! I want everything! I’m basically sobbing over ALL OF IT. Haha~! Me too. I’m sending my husband to this site asap. Last year I got a shrunken alligator head. Yuck! It’s like, dear, if you wanted a shrunken alligator head then go buy one……but please, not a gift for your wife! I didn’t even want to touch it was so grossed out!!!! A truly spectacular gift guide – the best one of the year. Anywhere. Exquisite! I adore your taste and this is a lovely gathering of things. absolutely love your gift guides! i just want to gift all of these things to myself. your gift guides are so lovely! Beautiful neutral color palette! Love the Rennes bag. Maybe I’m alone in this, but I feel like the text in your blogs is tracked out really far—the massive spacing between the letters makes it very uncomfortable to read. The font itself is beautiful but it was a bit of a headache coming here to read it instead from a blog-reader on my phone. is there a little one on the way, or are you thinking of it, or just hoping, the gifts for baby I don’t remember you having any of them in the past. New man+love=baby? Love the Base Range bra! 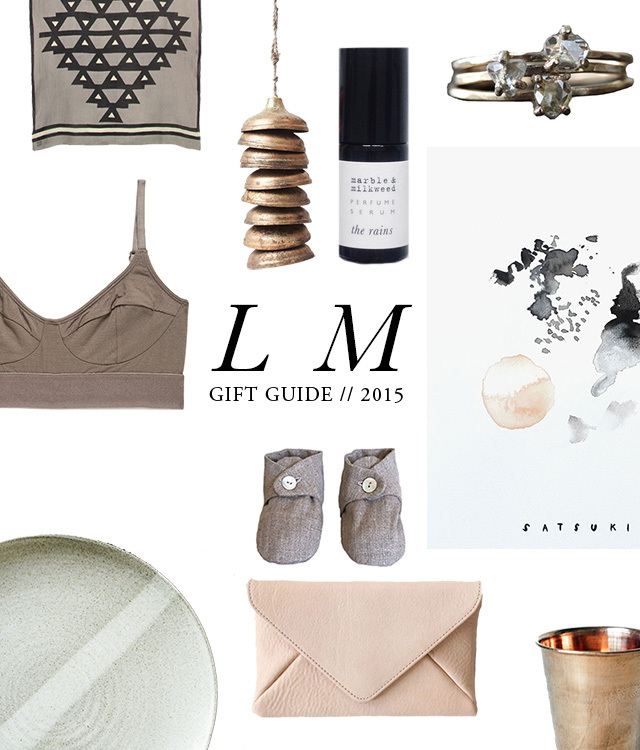 Thank you for putting together such a beautiful gift guide. I look forward to hearing about the Local Gathering with Wooden Spoon Herbs– flower essences are right up my alley.